The American artist Robert Motherwell (1915-1991) studied philosophy before becoming a painter. During the Forties, after a brief Surrealist phase, he turned to Abstract Expressionism, exhibiting with Rothko and Jackson Pollock. Described as a “philosopher-painter”, he has always combined practical and theoretical work. In 1948 he published a monograph on Max Ernst and was until 1952 editorial director of “Documents of Modern Art”, which brought together Dadaist paintings, drawings and manuscripts. His own painting, which by then had reached its full maturity, is marked by the obsessive recurrence of massive, brooding black shapes, somewhere between abstraction and calligraphy. 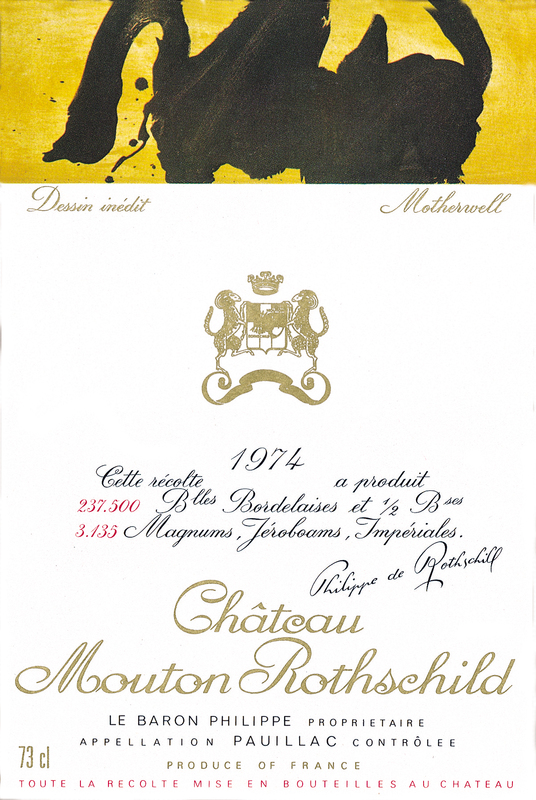 A perfect example of Motherwell’s work, the label for Mouton Rothschild 1974 gives proof of the creative power of one of the most representative spirits of the New York School.